This is to inform all concerned that the meeting with the student organizations scheduled at 11 am on 8th November at KTU office will now be held in the Conference Hall of Annexe II, Govt. Secretariat at 02.30 p.m. on the same day. The Hon'ble Minister for Education will chair the meeting. The student organizations are hereby requested to send the names of representatives who will be participating in the meeting (only two representatives) to the e-mail id: registrar@ktu.edu.in before 11.00 a.m. on 08.11.2017. 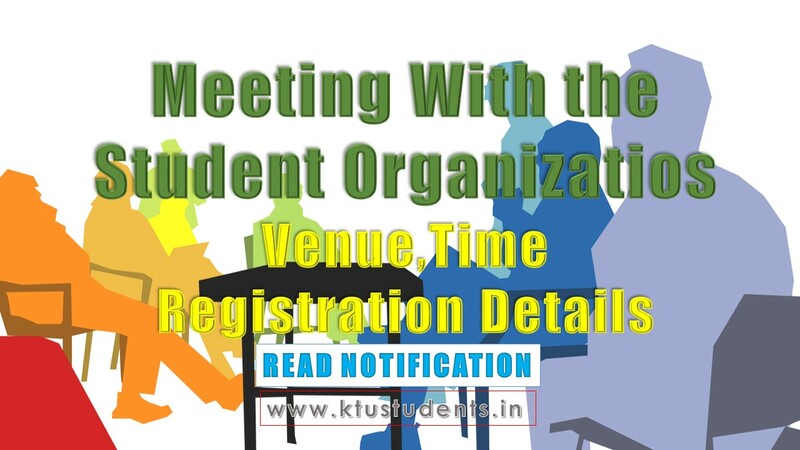 KTU Meeting with the student organizations shifted to Conference Hall of Annexe II, Govt. Secretariat at 02.30 p.m and to be chaired by Hon'ble Minister for Education This is to inform all concerned that the meeting with the student organizations scheduled at 11 am on 8th November at KTU office will now be held in the Conference Hall of Annexe II, Govt. Secretariat at 02.30 p.m. on the same day. The Hon'ble Minister for Education will chair the meeting.